A California postnuptial agreement is similar to a prenup in that it defines each party’s separate and community property interest in the event of a divorce or legal separation. While a prenuptial agreement is the preferred choice in establishing such legal rights, it is common for couples to obtain a postnuptial agreement. Some couples may seek a postnuptial agreement if there has been a breach of trust, substance abuse issues, a significant increase in a spouse’s financial position, or a large inheritance by a spouse. At San Diego Esquire, we can help you develop a postnuptial agreement that meets your needs. We provide affordable flat fee postnuptial agreement review services starting at $595. Our postnuptial agreement drafting services start at $795. Review our 100% money back guarantee. We highly encourage you to work with an experienced California postnuptial agreement attorney instead of relying on a do-it-yourself approach. 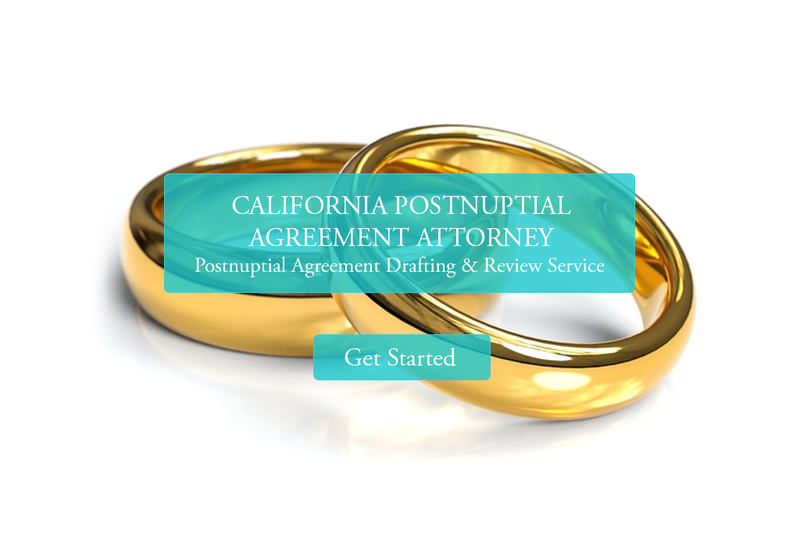 We provide flat fee postnuptial agreement review and drafting services to California residents. We only represent one party in postnup agreement drafting or review. We do not provide dual representation. Sign up to get started. As mentioned above, a postnuptial agreement is similar to a prenuptial agreement. A prenuptial agreement is executed before parties get married. Like a prenup, the postnuptial agreement will address how a married couple’s income and assets are to be divided in the event of a divorce or legal separation. A postnuptial agreement can also define specific assets as separate property and specific assets as community property. Most couples find it is easier to discuss these issues while they are on good terms rather than wait for an ugly divorce. There are a number of reasons why a couple would sign a postnuptial agreement. A common reason for signing a postnuptial agreement is that the couple never signed a prenuptial agreement, and now want an agreement in place. A postnuptial agreement is also useful if a couple’s finances have changed significantly since signing a premarital agreement, making the original terms of the prenup no longer fair. Postnuptial agreements can be a way to protect the inheritance of children from previous relationship, or it can ensure a treasured family heirloom remains in the family, or it can protect a business from having a spouse become an inadvertent partner. Essentially, a postnuptial agreement is a form of an insurance plan. In the event of a divorce, the couple can settle most matters quickly without an expensive, drawn-out negotiation. There are few things a couple is prohibited from including in a postnuptial agreement. The postnuptial agreement cannot have provisions for child custody and support. A postnuptial agreement can include provisions for spousal support, but there is no guarantee that a court will honor those terms. If the couple does end up divorce, they will need to figure out these issues during the divorce process. In contrast to a postnuptial agreement, a legal separation is a document created when then couple is already living apart. It is a similar to a divorce agreement, but unlike a divorce agreement, a legal separation will not dissolve the marriage. Many couples who legally separate wish to remain married for religious reasons or to continue receiving health or government benefits. Unlike the postnuptial agreement, which is a private document between the couple, in many states legal separations are filed with the court. Like a postnuptial agreement, a legal separation will contain specific provisions for property and debt allocation. If the couple are living apart and have minor children, the legal separation agreement will need to contain the terms of a child custody, visitation, and support issues. A legal separation can have provisions for spousal support. Some couples who get a legal separation do eventually divorce. If they do divorce, the divorce process is fairly simple. They just follow the terms of the legal separation agreement. Each spouse must fully disclose their financial information (ex – income, assets, debts, and property). Couples often obtain postnuptial agreements to aid in the process of reconciliation after a period of marital conflict. A postnuptial agreement can be drafted to address financial concerns while the couple continue to rebuild trust. A postnuptial agreement, or prenuptial agreement amendment, can also change the parties initial intent regarding financial divisions of income in the event of a change in economic circumstances not initially anticipated at the time of marriage.